Singer Corporation is one of the oldest and most reputable sewing machine manufacturers. Yet, it is known for innovation as much as reliability and top quality. Singer 9985 is designed to be a glance into the future. 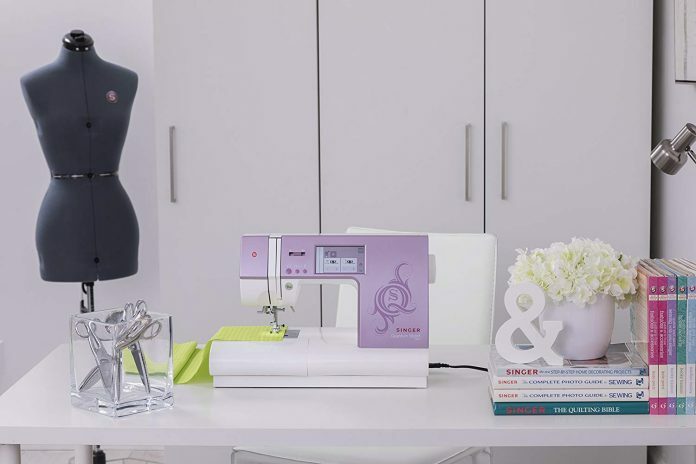 It is a computerized sewing machine packed with amazing features and abilities. I can’t imagine the project that you can’t take on with this machine. At the same time, it is very easy to use. So, when it comes to personal sewing machines, Singer Quantum 9985 is an ultimate monster. At least for the time being. Let’s dig deeper to find out what does this sewing machine offers. Singer Quantum 9985 has a nice and modern design. While it won’t make it perform better, I like the way it looks. Heavy duty metal frame makes it sturdy and durable. Stainless steel bed plate provides a smooth surface to allow the fabric to glide smoothly. So, the first glance is promising. With 960 built-in stitches, your creative options are almost limitless. It is likely that you will never use half of these stitches. Still, it is good to know that you have extra options. Also, it stimulates your creativity. When you know that you have so many options you will try to think of a way to use them. There are 10 basic stitches, 21 stretch stitches, and 919 decorative ones. 13 different one-step automatic buttonholes will allow you to sew these with ease. 6 styles of alphabet including Cyrillic(!) makes it easy to add words or a phrase. LCD is nothing short of impressive. Through the display, you can control almost every function. It comes with a memory to remind you when you forget what stitch or alphabet did you use. The touch screen will advise you and walk you through most of the processes. But, it won’t just show on display. A voice will talk you through the operation as well! There is a built-in program that provides visual and audio help. It includes bobbin winding, bobbin settings, threading, and pressure feet choice instructions. So, the touch screen is as good as it gets. The autopilot mode can come handy. You can unplug the foot control and use start and stop functions. The speed control function is mechanical. Just pull the lever to set the desired top speed. Speaking of speed, it is up to 850 stitches per minute. Beside regular stitch length and width adjustment, you can edit your stitches further. You can increase the stitch length up to five times while maintaining the density. Also, you can invert stitch patterns from side to side for more options. There are 25 different needle positions. You can choose the position for various sewing techniques. It is particularly handy for zippers, topstitching cords and more. Twin needle function is yet another nice feature. Of course, needle up or down stopping position is available. With all the bells and whistles it was only expected. Top bobbin drop in and automatic bobbin winding provide quick and easy threading and winding. When you select the stitch machine will choose the right tension for you. Features also include a free arm for sleeves and cuffs, drop feed for quilting and touch button for reverse stitching. Two LED lights will provide enough light and cast out the shadows. This machine is really a full package. 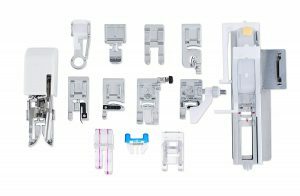 It comes with 13 presser feet, bobbins, needles, seam ripper, lint brush and many more. An extra-wide additional table will come handy for quilting and larger projects. With this machine, you get all you need for all kinds of projects. Easy to use – Even though it is packed with features it is easy to use. Touch, color, LCD screen plays a major part in this. It is intuitive and helps you navigate easily. Large sewing area will allow you to perform delicate operations with ease. Excellent performer – A powerful motor allows smooth and excellent performance. It can sew up to 850 stitches per minute which is fast. There are faster machines, though, but this is more than enough when it comes to speed. The machine is smooth and very precise. Versatility – Whatever you can think of this machine can do. It really covers all the bases and then some. From beginners to more advanced sewers it provides plenty of options. You can experiment a lot and yet you will never run out of new options. It is quiet – Singer Quantum 9985 runs pretty quietly. So, you won’t drive your family members crazy. Not to mention the neighbors. Durability – It is one of the Singer’s signature features so this one is no exception. Heavy duty metal frame ensures that your machine will last. It comes with a 25-year warranty as well. Heavy fabric – Some users have complained that they have had problems with heavier fabrics. With the right choice of accessories, this machine can do some heavy duty sewing. But, it is not a full heavy duty machine so you make sure you don’t do it too much. 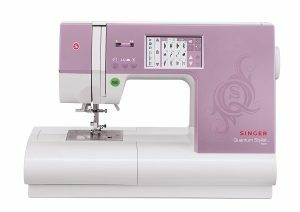 I will stick with my first impression: Singer Quantum 9985 is an outstanding sewing machine. While it is not the most affordable one, it is so for a reason. It is a great choice for beginners as it is intuitive and easy to use. However, it comes with a lot of amazing features that will allow you to grow. Advanced sewers will enjoy using it, as well. So many features and accessories allow you to take on almost any project. Creative possibilities are countless. Turning delicate projects into a breeze is enough to fall in love with this machine. Add into the mix aforementioned qualities and you get the best value for money.